The CVO-2 STANDARD Package is a 2 cubic foot, benchtop vacuum oven paired with a clean, oil-free scroll pump. This package is an ideal benchtop set up for vacuum drying or purging temp sensitive material requiring a steady, gentle, non-turbulent purge. This complete system will liberate solvents, water or other unwanted compounds in a small batch, R&D, laboratory environments. Processing Temperature Sensitive Material? The CVO-2 comes in both low temp & high temp versions. 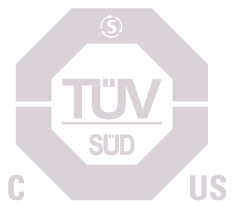 Be sure to get the low temp CVO-2 version that has excellent temperature uniformity for temperature sensitive products such as pharmaceuticals, slurries or any product that can be damaged or destroyed by temperature fluctuations. At time of order we will verify the high / low temp version best suited to your requirements. Both oven and pump can run off a single dedicated 120V / 1ph / 20 AMP circuit. Vacuum oven to pump connection kit. 3/8th diameter vacuum rated tubing and KF hardware. Oil-Free. Eliminates contamination risk. Will not smoke out exhaust, no filter required. Maintenance requires the replacement of a single “tip seal”. Low cost of ownership. Have questions? Call 503-847-9047 for vacuum drying expertise. Contact us for expert direction on selecting your vacuum oven packages by dialing extension #1. Free Shipping Note: When ordering online, shipping is free! The CVO-2 STANDARD Package is shipped as heavy freight. Delivery to residences or no-forklift locations can add up to $120 for liftgate services. At time of order, Cascade will contact you to arrange your specific delivery requirements. The Cascade CVO-2 uses a unique control logic not found in most lab grade vacuum ovens. The temperature probe is INSIDE the oven, which minimizes temperature overshoot and delivers best-in-class temperature stability and uniformity particularly in the low temperature ranges. Accurate, stable temps throughout the CVO-2 eliminate hot and cold spots, making accurate use of every inch of shelf space. The Cascade Sciences CVO-2 is equipped with a heating cutoff system that will automatically stop power to the heaters when the oven shelf temps exceed 392°F or 200°C. This protection system will provide peace of mind for overnight processing or unattended vacuum bake outs. NRTL Certification #U8 170464972 077. No Extra cost. 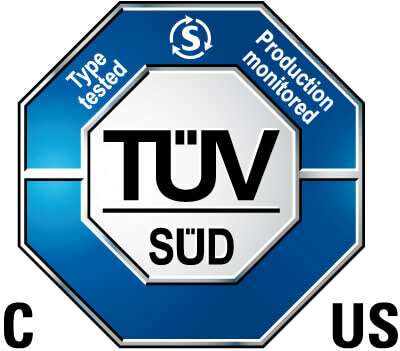 The CVO-2 Vacuum Oven comes certified by the Nationally Recognized Test Lab, TUV. This certification is a requirement by many municipalities. The digital vacuum gauge installed on the CVO-2 is factory default set to read in inches of mercury (“Hg) with a scale of 0 – 29.9”Hg. Change the unit of vacuum measurement to read in a wide variety of units from mmHg, bar psi, kPa, cm2, mmH20. Zero out the vacuum gauge to calibrate for just above sea level adjustments. The CVO-2 features a rear mounted data port which outputs a digital log line once per minute. Viewing/logging this data requires terminal emulator software such as the open source (BSD License) emulator Tera Term. Introduce inert gasses such as nitrogen, argon, helium, etc. as part of your process via the ¼” rear vent barb. The maximum backfill pressure is 15PSI. In an overpressure situation, a simple, built-in safety relief allows gasses to escape via a spring loaded tempered window. The CVO-2 ovens offer two different vacuum oven connection points. The standard connection is a 3/8th dia barb located at the rear of the oven. It is connected to the vacuum valve level on the front control panel. 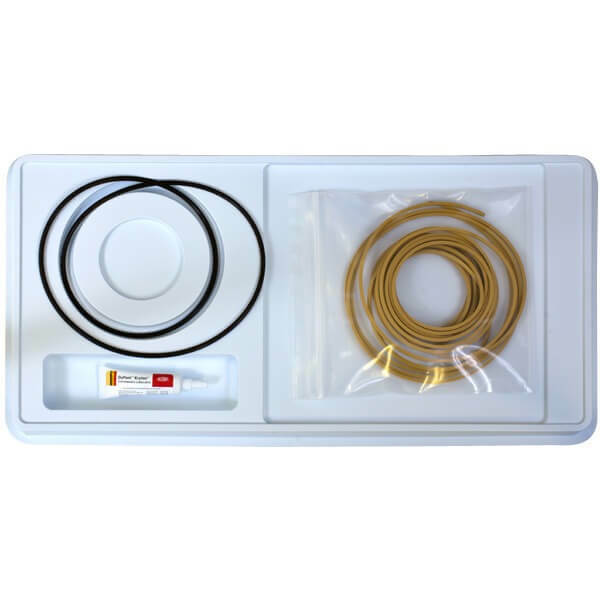 For even faster evaporation, purging or drying consider upgrading to the MAX EVAP connection kit. The MAX EVAP connection kit secures to the oven’s rear 1” dia KF-25 port located on the back center of the chamber. The MAX EVAP connection never reduces flow by continuing with 1” diameter vacuum rated clear lines, a 1” dia KF-25 side mounted vacuum valve and KF-25 fittings and hardware. This KF-25 port can also be used to run temperature feedthrus, or monitoring sensors inside the vacuum chamber during processing. Under vacuum, there is no air inside a vacuum oven. Temperatures are achieved by a process of conduction and radiation to move temperatures into the product inside the oven. Cascade’s stackable shelf design makes the most of this opportunity by making the chamber longer and narrower, rather than square and supplies stackable shelves in multiple height configurations to allow for the fastest, most uniform transfer of heat. For anyone that has struggled with consistently turning the small, round, low-quality vacuum/vent valves, relief is in sight. You will love our large, quarter-turn vacuum/vent valves. Your wrists will thank you! Cascade ovens are made in Oregon, USA with high quality materials. Our glass is NGI-USA Tempered and certified to ANSI Z97.1.2007 16CFR / 201 11. Our door handles are rugged brushed steel, not plastic. Our vacuum vessels are constructed with American made steel. We’ve tried lower cost, imported steel, but over time, vacuum chambers made of lesser quality/lower tolerance material cannot withstand the flex and pressure changes of vacuum pumping/venting/purging. This can deteriorate vacuum integrity and the oven will lose its ability to hold vacuum. Cascade’s vacuum ovens come standard with a solvent resistant BUNA door gasket. For higher temp applications, we offer a cured Silicone gasket as well. Ask us about the variety of door gaskets we can supply based on your application: Silicone, BUNA, Viton, Flourasilicone. Gaskets will eventually wear out. It’s ideal to keep a few spares on hand. All shelves are adjustable, but not removable. The CVO-2 VAC OVEN comes in both low temp and high temp versions. The low temp version has excellent temperature uniformity for temperature sensitive material. The higher temp version, 220°C has a uniformity about 6.5% of setpoint. At time of order we will verify the high / low temp version you require.